The greatest feature of the home. This $3,109,000 home. Something I had never seen before, and frankly, hope to never see again. The igallop. I kid you not. This device shown above sat along side a nordic trak within the home's fitness room. And I promise, I did not at all crawl on my hands and knees in the $3,109,000 home to figure out how to turn on the igallop, and I did not then climb on and test it out within one of the most expensive homes in Minnesota. Not at all. I would not do that. Yes, the igallop. Maybe I'm totally behind the curve and everyone knows about the glories of the iGallop. Maybe I have missed the iGallop phase, but this blows the snuggie hoopla out of the water. Thank you for allowing me to parade through your homes. They were lovely, albeit overpriced, but lovely. I do not plan to buy any of them, but I would like to share that the decor was quite atrocious in most of the homes. Since you asked and all. Further, I would like to thank you for the comic interlude which culminated my experience of the 'Tour de Homes'. The iGallop. When building this $3.1 million home I bet you were thinking to yourselves, gee, every $3.1 million home needs a faux horse in which to ride. Faux horse indeed. No need to waste ones time with a treadmill when you have the iGallop. Thank you for your time, and allowing me to do what I love most - peer into the lives of others. Particularly those who own iGallops. Next time, it would be way more fun if these homes were occupied, and they were more surprise visits with thousands of people - here to view their homes. I dunno, just a thought. I don't understand. Is the iGallop only for feline use? Or is it for human use? And why? More explanation needed please! Oh no, the iGallop is for human use, this is just a cat who climbed on to it. 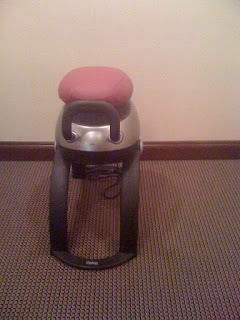 You sit on it, and it thrashes you around like you're on a horse.